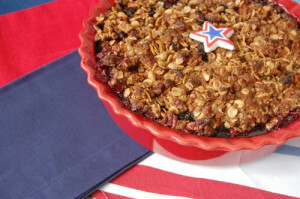 Article first published as Star-Spangled Desserts on Technorati. I love holidays! The 4th of July is no exception. I enjoy creating wonderful memories with my friends and family gathered together by the bay for a special celebration! 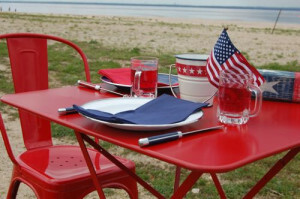 We gather in early evening , sitting out of doors sharing a meal focused on food made on the grill. When dusk arrives, we have dessert and watch fireworks from the deck over the bay, as each town adds some spectacular colors to the sky. The desserts need to be as special as the firework displays in the sky. Here are a few of my favorite star spangled desserts to try for your own celebration. From by the bay wishing you the happiest 4th of July food memories! sheet in to the oven and bake for 25 minutes. Remove from oven and cool. Serve at room temperature as is or serve with ice cream or whipped cream. Preheat the oven to 350F. Take a 9 inch spring form pan and line with aluminum foil wrapping the outside twice. It’s important to keep water out when cooking with bain marie. To make crust use food processor to finely grind the wafers, then add sugar and melted butter and process until moist. Take out and place in bottom of spring form pan. Press down with fingertips to cover the bottom of pan. Bake the crust until set about 12 minutes. Cool crust. To make the filling : Using an electric mixer beat the cream cheese and sugar. Make sure to scrape down the mixture with a spatula from the sides of the bowl. Add the eggs and continue to beat. Next add the vanilla until all is well blended. Take a bow and add 1/3 of the batter. To the batter add the melted chocolate and food coloring. Pour the chocolate cheese mixture onto the cooled crust in the spring form pan. Next pour on top the remaining batter. Place the pan into a roasting pan add hot water to the roasting pan until it’s half the height of the spring form pan. Place in oven and bake for 50 minutes. In themeantime, make sour cream topping by combining the sour cream, sugar and vanilla. After the cheesecake has baked for 50 minutes remove from oven and spread the sour cream topping evenly across the top. Place back into the oven for another 10 minutes,. At this point the cheesecake should be set. Take out of the oven. Remove carefully from the bath. Transfer to a wire rack to cool. Cover with foil and place in refrigerator over night to set. 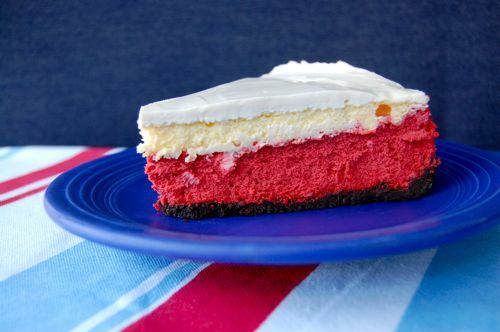 This entry was posted in cakes, desserts and tagged 4th of July recipes, baking, berry recipes, cheesecake recipes, crisp recipes, outdoor entertaining recipes, red velvet recipes, summer food, summer recipes on May 23, 2014 by entertainingbythebay.